The Miniature Golden Retriever is a designer hybrid consisting of Golden Retriever, Poodle and Cocker Spaniel. The breed originated within the United States. The coat of the Miniature Golden Retriever should closely resemble it's larger counterpart. Though there is Poodle within the mix, the coat should be straight. Accepted colors are gold, dark gold, red, cream, and white. The Miniature Golden Retriever is a mixed breed, therefore, it is recommended to research the character of each breed involved. Your puppy could have any combination of the included breed's character. The Miniature Golden Retriever is a mixed breed, therefore, it is recommended to research the character of each breed involved. Your puppy could have any combination of the included breed's character. The Miniature Golden Retriever is a mixed breed, therefore, it is recommended to research the temperament of each breed involved. Your puppy could have any combination of the included breed's temperament. You can find Miniature Golden Retriever puppies priced from $700 USD to $4700 USD with one of our credible breeders. Browse through our breeder's listings and find your perfect puppy at the perfect price. The Miniature Golden Retriever is a mixed breed, therefore, it is recommended to research the temperament of each breed involved. Your puppy could have any combination of the included breed's temperament. Care for the Miniature Golden Retriever will be very similar to that of the Golden Retriever, as they will need regular brushings and their ears will need regular attention to prevent infection. Research may be necessary to determine possible health risks regarding the various breeds within this designer hybrid. The Miniature Golden Retriever is an easy to train breed, as they are very intelligent. The consistent pack-master will have no trouble teaching this breed new tricks. 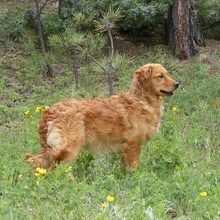 A high energy level is common in the Miniature Golden Retriever. This breed will require daily brisk walks or jogs in addition to regular play. Not getting this breed their necessary exercise could result in naughty behavior. Miniature Golden Retriever Puppies for Sale - Shipped Worldwide! Finding the right Miniature Golden Retriever puppy can be dog gone hard work. PuppyFind® provides a convenient and efficient means of selecting and purchasing the perfect Miniature Golden Retriever puppy (or Miniature Golden Retriever puppies) from the comfort of your home, 24 hours a day, 7 days a week. Take advantage of our PuppySearch or leisurely browse our directory of hundreds of dog breeds, Miniature Golden Retriever dog breeders, Miniature Golden Retriever dogs for adoption, and Miniature Golden Retriever puppy for sale listings with photos and detailed descriptions. Some Miniature Golden Retriever puppies for sale may be shipped Worldwide and include crate and veterinarian checkup. Many Miniature Golden Retriever dog breeders with puppies for sale also offer a health guarantee. With thousands of Miniature Golden Retriever puppies for sale and hundreds of Miniature Golden Retriever dog breeders, you're sure to find the perfect Miniature Golden Retriever puppy.